Straw Man – Arguments, these are arguments NOT made by the Final Order and therefore Maharaja defeating these arguments is pointless. Red herrings – These are statements with which either we agree or which are simply begging the question and thus not directly relevant to the matter at hand, but simply diverting attention from the real issue. Already Defeated arguments – Here Maharaja simply repeats old arguments that have already been defeated. Fuller rebuttals than offered here are found in the Final Order and other papers. Quotes from Maharajas paper shall be boxed in speech marks. Our response shall follow. The instruction is specifically devoid of ANY time considerations at all since it is a PERMANENT policy directive to be instituted by the managing officers of the institution to whom the directive is issued. Thus the applicability of the directive is tied to the institution that has the responsibility to implement the said policy. Time considerations only become relevant if the policy thus issued is to be TEMPORARY. The author is stating that the July 7th conversation dealt with the pre-samadhi period ONLY. Yet the GBC also state in Disciple of My Disciple that the May 28th conversation deals with POST-samadhi ONLY. So how can a pre-samadhi only conversation be a furtherance of a POST-SAMADHI ONLY conversation? How can the statement of the PRINCIPLE of what happens WHEN the order occurs BE the DIRECT ORDER? We have repeatedly asked to see these MANY references where Srila Prabhupada orders his disciples to initiate immediately upon his departure. All we have seen are no more than half a dozen statements where Srila Prabhupada simply states the principle that such initiation CAN only take place after the Guru departs. NOT an ORDER that such an activity MUST happen. Since we are simply stating the STATUS QUO that existed in 1977, by definition we do not need to provide any proof, since we are not PROPOSING any change or alteration to substantiate. It is those who wish to institute a change to the STATUS QUO that existed in 1977 who must provide proof to substantiate their alteration. The July 9th letter is the proof that a ritvik arrangement was made in ISKCON. The issue of pre- and post samadhi is irrelevant to ISKCON, which was set up to exist for 10,000 years. The policy directive is tied to the institution that must implement it. The issue of Srila Prabhupadas pre and post samadhi periods are only relevant to such an instruction if it can be shown that the process of diksa has relevancy to physical considerations of time and space. So far no relevancy has been demonstrated. It is significant to note that such vast evidence is NOT provided by the author in the rest of the paper, even though he claims here that he will do so. “His Divine Grace Srila A. C. Bhaktivedanta Swami Prabhupada explained that his “secret of success” was the fact that he strictly followed the instructions of his spiritual master Om Visnupada Srila Bhaktisiddhanta Sarasvati Thakur. Srila Prabhupada diligently protected the purity of ISKCON by always insuring that ISKCONs activities remained in accordance with sadhu, sastra and guru. It is inconceivable to consider that Srila Prabhupada would ever do anything which wasnt in accordance with sadhu, sastra and guru principles and references. Moreover Srila Prabhupada taught that a fundamental principle of Krishna consciousness was that the spiritual master and all vaisnavas must always follow sastra as the basis for all Krishna conscious activities. Srila Prabhupada has instructed that throughout his transcendental literatures which are the maximum authority for the Krishna consciousness Movement. Srila Prabhupada again emphasizes that spiritual matters must always be tested according to sadhu, sastra and guru. Here Maharaja simply states something that is not in dispute, just to set up a straw man argument, as we will see next. Prabhupada: And we are following what Krsna says. Then our life, successful. According to our sastra, mind is meant for speculation. It does not give us any definite knowledge. My mind is working in one way; your mind is working another way. There is no conclu… Manorathenasati dhavato bahih. This is the result of mental speculation. And Gita also says that manah sasthanindriyani prakrti-sthani karsati. This spiritual spark, being bound up by the mind and the senses, is struggling hard on the material nature. And hes simply struggling. No fixed up condition. Everyone will say, “I think this is right.” What is right, he does not know. That is struggle. Is it not? Prabhupada: Viraraghavacarya, Sanatana Gosvami, Visvanatha Cakravarti. We are just trying to explain their ideas. We are teeny. Pradyumna: I think your commentary on Srimad-Bhagavatam will go down in history as one of the most…, one of the best commentaries. It will go down. Prabhupada: Let us try for that. Prabhupada: And Dr. Ghosh has his scheme, but actually the scheme is there in the Bhagavad-gita and Srimad-Bhagavatam. We want to introduce that scheme to our Gurukula. We havent got to manufacture scheme. Is that correct? Prabhupada: Sruta-grhitaya. And sruta-grhitaya is Vedanta knowledge, not sentimental. Sruta-grhitaya. That is sound knowledge. Discuss Bhagavatam daily, as much as possible. Everything will be clarified. Because Bhagavata is the essence. Nigama-kalpa-taror galitam phalam idam. And vyasadeva-krta. Kim anyaih sastraih. When hes self-realized, he made this. Maha-muni-krte. So the more we read Srimad-Bhagavatam, the knowledge becomes clarified. Each and every verse–transcendental. Is this clear? Prabhupada: And all the acaryas say. We have to follow the acaryas. Very good. Srila Prabhupada changed something at the last minute. That such a change would have been against Guru, Sadhu and Sastra. As well as the above being a straw man argument it simply begs the question since Maharaja is simply stating the very point he actually needs to PROVE i.e. that ritvik is indeed against Guru, Sadhu and Sastra. As already stated, there was nothing to change. Rather the July 9th letter simply KEEPS THINGS THE SAME or UNCHANGED Srila Prabhupada as the Guru for ISKCON. THIS was what Srila Prabhupada had always taught. The idea of regular guru was never taught by Srila Prabhupada how could it be he only ever even used the term once on May 28th, 1977. THIS is what would have been a drastic change since the concept of regular guru had never ever been mentioned by Srila Prabhupada before. Also even just the very idea that Srila Prabhupadas disciples must initiate their own disciples upon his departure is only alluded to half a dozen times what to speak of there being any order to actually do it. Another statement that is not in dispute again used simply to set up some more false straw man arguments, as we shall now see. “Yet sometimes the pro-rtvik camp propose that Srila Prabhupada as the “Acarya” can do anything. They say Srila Prabhupada can set new “precedences” and make changes in sastra. In other words they are accepting that the concept of a system for giving initiations after the spiritual master has physically left the planet by “proxy” or Rtvik initiators is not authorized anywhere according to sastric evidences. If it is authorized anywhere by sastra then they should show it, but so far nothing has been demonstrated.Actually Srila Prabhupada always followed the sastra and didnt change any principle of sadhu, sastra and guru. In the details of how to apply the sadhu, sastra and guru injunctions Srila Prabhupada may have set precedences, but that is not creating something new which wasnt in sastra. In order to demonstrate that kindly consider the points the rtvik proponents cite as examples of Srila Prabhupada setting a new precedence not in sastra.Reducing the number of rounds from 64 to 16: This doesnt change the principle of chanting and counting rounds every day. It merely changes the number of rounds. Actually Srila Damodar Maharaj, Srila Prabhupadas Godbrother, informed us that 64 rounds was for those who didnt go out and preach, but for those who were actively preaching in the Gaudiya Math 16 rounds was allowed by Srila Bhakti Siddhanta Sarasvati Thakur. So actually Srila Prabhupada didnt change anything, but applied the preachers standard to ISKCON and engaged us in preaching. Performing marriages: This is also not against sastra and Srila Prabhupada explained this specific point in BG Ch 18 on Vivaha Yajna. Allowing women to live in temples: Srila Prabhupada explained that the word “Math” in Gaudiya math meant monastery and in a “Math” only renounced asramas and elderly widows lived. Srila Prabhupada explained that he therefore didnt create Gaudiya Math and instead made temples. Srila Prabhupada explained that there is no absolute restriction for women or householders living in a temple. Just as in the Srirangam Temple complex families and women live. Therefore, Srila Prabhupada preserved the sastric principle. Giving Gayatri by tape: This is simply “utility is the principle”! The sastra states that the disciple should hear from the spiritual master. Srila Prabhupada instructed that only those approved for receiving second initiation could listen to the tape. So Srila Prabhupada didnt change a principle, but merely applied it using modern facilities. Nevertheless, this is a detail and doesnt establish that Srila Prabhupada did or would do something against sadhu, sastra and guru. “Regarding the validity of the brahminical status as we accept it, because in the present age there is no observance of the Garbhadhana ceremony, even a person born in brahmana family is not considered a brahmana, he is called dvijabandhu or unqualified son of a brahmana. Under the circumstances, the conclusion is that the whole population is now sudra, as it is stated kalau sudra sambhava. So for sudras there is no initiation according to the Vedic system, but according to the Pancaratrika system initiation is offered to a person who is inclined to take Krsna consciousness. “During my Guru Maharajas time, even a person was coming from a brahmana family, he was initiated according to the pancaratrika system taking him to be a sudra. So the birthright brahmanism is not applicable at the present moment. The sacred thread inaugurated by my Guru Maharaja according to pancaratrika system and Hari-bhakti-vilasa by Srila Sanatana Goswami must continue. It does not matter whether the priestly class accepts it or not. When my Guru Maharaja Bhaktisiddhanta Sarasvati Goswami Prabhupada introduced this system, it was protested even by His inner circle of Godbrothers or friends. Of course He had actually no Godbrothers, but there were many disciples of Bhaktivinode Thakura who were considered as Godbrothers who protested against this action of my Guru Maharaja, but He didnt care for it. All the above is simply defeating statements never made by the Final Order. We never state that ritvik is a change to sastra, nor that the above precedents are changes to sastra. It needs to actually be proven through statements from Srila Prabhupada that he continually taught that he would STOP being the Guru upon his departure, and that after his departure his disciples MUST take over INITIATING disciples as their own. Such statements have never been produced though we do have statements re-affirming that things will CONTINUE and that there will be NO CHANGE. That ritvik is a drastic change to the parampara and that it avoids the obvious requirements of some direct instructions from Srila Prabhupada are the very points that need to be proven. The author has not even attempted to provide this proof in this paper, nor does he state where such proof may exist. “I was asked “what is wrong with Rtvik post-samadhi proxy initiations?” What is obviously wrong is it contradicts the system elucidated by Srila Prabhupada known as Guru Parampara. Although this system should be well known to all, since I was asked I am providing some sastric references from Srila Prabhupada books and lectures below. The perfection of the parampara system, or the path of disciplic succession, is further confirmed. In the previous chapter it has been established that Brahmaji, the firstborn living entity, received knowledge directly from the Supreme Lord, and the same knowledge was imparted to Narada, the next disciple. Narada asked to receive the knowledge, and Brahmaji imparted it upon being asked. Therefore, asking for transcendental knowledge from the right person and receiving it properly is the regulation of the disciplic succession. This process is recommended in the Bhagavad-gita (4.2). The inquisitive student must approach a qualified spiritual master to receive transcendental knowledge by surrender, submissive inquiries and service. Srila Prabhupada describes lucidly the principle of Guru Parampara or disciplic succession. It is clear that one spiritual master passes the knowledge to his disciple through direct communication. That disciple becomes guru and in turn passes it onto the next generation. The issue is does the disciple HAVE to become the next Guru IMMEDIATELY upon the departure of his Guru, which is Modification B, from the Final Order. None of the above quotes show this. All we are stating is that Srila Prabhupada remains current for ISKCON, which in the context of the parampara is a miniscule portion of time. “Srila Prabhupada has expressed his personal desire on many occasions to see his disciples become spiritual masters and initiate new generations of disciples. I am not mentioning all those well known quotations here, but mainly the principle of disciplic succession. Still the following verse highlights His Divine Graces consistent mood. These are the half a dozen or so quotes mentioned earlier where Srila Prabhupada alludes to the principle that the disciple must wait until the Guru has departed before initiating. This is the NOT the same as many occasions where Srila Prabhupada is ordering his disciples to become diksa gurus. “The following verse not only illustrates the system of disciple succession, but also the qualification for being a spiritual master. One must learn properly from ones own spiritual master and then transmit that knowledge intact to the next generation. Again Maharaja is simply stating the very point he has to prove – that ritvik does indeed break the disciplic succession. Infact by definition, ritvik, which means Srila Prabhupada is the current link in the disciplic succession, simply MAINTAINS the disciplic succession. Ritvik is simply a sanskrit word meaning priest. It is not a doctrine. We are not proposing anything. 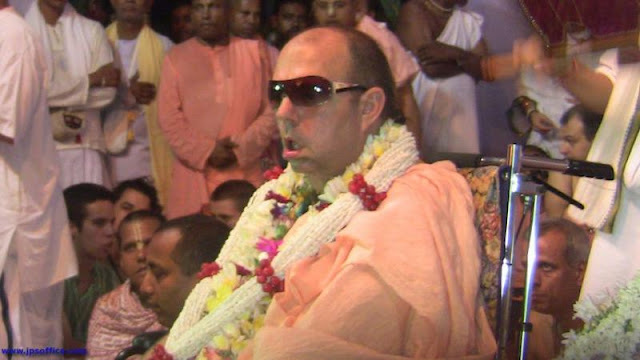 It is the GBC who have proposed something that they have no sastric support for that Srila Prabhupada MUST vacate his role as diksa guru for ISKCON immediately upon his departure. The end result of there being no change upon Srila Prabhupadas departure is simply that a bona fide guru is the current link in the disciplic succession something that there is plenty of sastric support for indeed the disciplic succession is actually DEFINED by this principle. Bona Fide current links ARE the disciplic succession. By the same token we wonder why then Maharaja is so hesitant to accept the reduction in stature the GBC are currently proposing for himself?! We would love for Maharaja to produce us the sastric reference that DOES advocate a ritvik system whilst the spiritual master IS present. If he cannot, then by his own logic, there is no way Srila Prabhupada would have wanted it to happen! Also as already stated we are simply stating that a Bona Fide Guru can be current link in the disciplic succession. We have plenty of sastric evidence for that. It is the GBC who have decided to limit such Bona Fide Gurus participation in the disciplic succession by considerations of time and space. Let them show sastra for THAT, which is the actual point of contention. As we have already pointed out, Maharaja nor the GBC have ever been able to produce evidence where Srila Prabhupada said the opposite time and time again. To understand why such evidence cannot exist, consider what it is that needs to be OPPOSED. We say that Srila Prabhupada is the Diksa Guru for ISKCON. Thus Srila Prabhupada would need to have said time and time again either that I am NOT the Diksa Guru for ISKCON or that I will only be the Diksa Guru for ISKCON until I depart. No such statements exist. As for specifically stating that he IS the Diksa Guru in and for ISKCON, this is something that Srila Prabhupada established as a fact simply by practice, and he told the GBC that they are instructor gurus and that he is the initiator guru (Letter to Madhudvisa, 1975). There is no need for Srila Prabhupada to SPECIFICALLY state that he will the diksa guru after his departure any more than there is a need for him to state that he will be so ONLY in his presence. Indeed if he has not stated the latter restriction, then unless such a restriction can be proven, there is no reason to assume that Srila Prabhupadas tenure as diksa guru for ISKCON was ONLY limited to his physical presence right from the outset. Indeed only if such an assumption existed could one justify even asking for a statement where Srila Prabhupada specifically clarifies that certain activities will also pertain to after his departure. The fact that Maharaja needs to resort to taking evidence from Srila Prabhupadas godbrothers in how they followed Srila Bhaktisiddhanta Sarasvati Thakurs instructions after his departure, merely highlights the desperation with which Maharaja is trying to find evidence. Again Maharaja is merely assuming that which needs to be proven. He needs to first demonstrate that the idea that Srila Prabhupada is the current link in the disciplic succession is new and against his consistent instructions. Throughout ISKCONs history Srila Prabhupada was the only Diksa Guru that was known. Srila Prabhupada gave no instructions that he would stop being the diksa guru at departure. Unless such a specific order is found, how can the GBC expect any loyal follower of Srila Prabhupada to accept this proposal? Then we will see what evidence there is for how they should function vis a vis Srila Prabhupada. But where, when and to whom was such an order ever given? Maharaja has admitted above that such Gurus would only be made BY his order. Maharaja here seems to be displaying some confusion since earlier on he said that officiating acaryas are also known as ritviks. So what is the point of discussing the perimeters for an entity that Maharaja has stated simply cannot exist post-samadhi? We totally agree since such lacuna are not brought up by the IRM, OR Final Order proponents. We wonder who it is that has created this new paradigm? Maharaja has not produced any evidence that Srila Prabhupada as the diksa Guru for ISKCON is a new paradigm. Indeed it is a very old and only paradigm known to us in ISKCON. Maharaja is skating on thin ice here since there are many things about ISKCON and its foreign Gurus that other sampradayas do not accept. What to speak of other sampradayas, even the Gaudiya Matha does not accept so much coming from the GBC, with the origin of the soul being just one of them. Indeed it is for this very reason, to protect us from ridicule from the other sampradayas, that Satyanarayan and co. have suggested so many adjustments to the teachings of Srila Prabhupada. For Maharaja to suggest similar reasoning in this case only demonstrates hypocrisy. Maharaja needs to wake up and realise that all of Srila Prabhupadas hard work in this respect has practically been thrown away by ISKCONs unauthorised Guru system that has run for the last 21 years. It is already considered an apa-sampradaya by so many people due to its, paedophiles can be in the parampara, and other colourful doctrines. Prabhupada: Hare Krsna. One Bengali gentleman has come from New York? Tamala Krsna: Yes. Mr. Sukamal Roy Chowdury. Prabhupada: So I have deputed some of you to initiate. Hm? Tamala Krsna: Yes. Actually… Yes, Srila Prabhupada. Prabhupada: So I think Jayapataka can do that if he likes. I have already deputed. Tell him. Prabhupada: So, deputies, Jayapatakas name was there? Bhagavan: It is already on there, Srila Prabhupada. His name was on that list. Prabhupada: So I depute him to do this at Mayapura, and you may go with him. I stop for the time being. Is that all right? Tamala Krsna: Stopped doing what, Srila Prabhupada? Prabhupada: This initiation. I have deputed the, my disciples. Is it clear or not? Prabhupada: You have got the list of the names? Srila Prabhupada had NOT stopped initiating in the transcendental sense since he still took disciples, and the person in this example would also have been still initiated by him. Thus Srila Prabhupada can only be referring to his actually physically performing the ceremony, which he would still do in when he was physically on hand to do so. Thus for Srila Prabhupada to simply perform the fire yajna for persons who physically approached him would not in anyway have interfered with the worldwide ritvik system that was set up. In fact Srila Prabhupada even alludes to this arrangement when in the July 7th conversation, Srila Prabhupada mentions both himself and Jayapataka Maharaja as being on hand to assist in the ritvik process for India. To stop the ritvik system completely Srila Prabhupada would have had to single-handedly start conducting every initiation himself, which is absurd since he had stopped doing this many years ago, not just on July 9th. All that happened on July 9th was that the final activity in which he was involved in, the formal issuing of the name, was also devolved. There is no evidence that at this point Srila Prabhupada was so ill that he could not issue names, especially since he was still able to have lengthy conversations and translate. 2) And given a theory that is against sadhu, sastra and guru references. The ritviks propose nothing. They merely ASK- why was our spiritual master kicked out of his role as diksa guru for ISKCON one second after he physically departed. To this question the GBC have no answer. And until they give a satisfactory answer, the status quo remains, and Srila Prabhupada is the diksa guru for ISKCON.